Diary of a Reluctant Dreamer: Undocumented Vignettes from a Pre-American Life is a humble book born out of a humble life, a chronicle of Ledesma’s shifting identities over the years; a patchwork quilt of doodling and sketches, self- and family portraits, comic-satiric and overtly political cartoons, and heart-rending short pieces and longer essays about his and his family’s American experience(s). 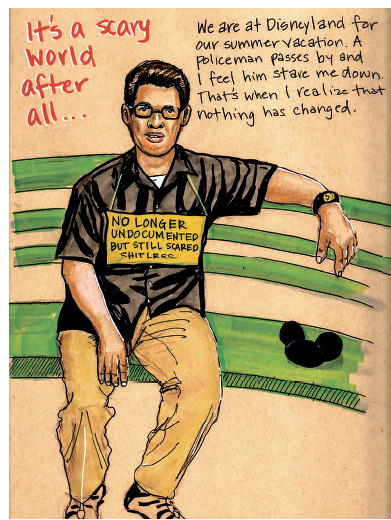 It’s the stunning, hand-illustrated chronicle of Alberto Ledesma’s twelve years in undocumented limbo and the psychological toll those years exacted. Drawing—or doodling, as he often calls it— became of one Ledesma’s most reliable coping mechanisms for the stresses of living in the US without documentation. He began the doodling practice as a quiet act of defiance, since even privately acknowledging one's lack of papers broke a cultural taboo held by many insiders in Ledesma’s undocumented community. This taboo reached inside the very walls of his family home, where the fear of detection and deportation hung like a black cloud over their daily existence. In this work, Alberto Ledesma offers a perspective of the American experience that few have written about, plumbing its layers of complexity through richly observed episodes, supplemented by striking text-and-image panels. His personal stories reveal troubling family dynamics, from the pain of feeling misunderstood to his father’s emotional unavailability and bouts of drinking. They also explore Alberto’s adolescent years, when the ache to free himself from the constant secrecy demanded by the family’s status was at its height. Stories of close calls render the fear palpable. In one vivid example, Alberto, his siblings, and their mother sit in a parked car next to a field while their father wanders into the undergrowth to pick wild cactus leaves. As cars occupied by white people pass by, some drivers cast suspicious glances at the Mexican family. When one of the sisters spots a no-trespassing sign, tension turns to panic and eventually to anger at their father for placing them in such a vulnerable position. Ledesma ultimately transitioned into academic life, earning a Ph.D and landing a teaching and administrative position at the University of California at Berkley. He connects his academic drive to the phenomena of “hyper-documentation.” Originated by Dr. Aurora Chang, this term “describes the effort by Dreamers to accrue awards, accolades, and eventually academic degrees to compensate for having been undocumented.” The burdensome effect of this impulse comes through in one of Ledesma’s most potent drawings, which shows a brown-skinned person dressed in cap and gown, pulling a file cabinet tethered by rope and bursting with award certificates. “A” is for the ABUELITOS left back in Mexico and the knowledge that until you fix your status you can’t go visit them no matter how much you miss them. “E” is for the EDUCATION your mother asked you to get so that you wouldn’t end up working at the same garment factory she did. Crossing the southern border without papers is an act fraught with peril, but as Diary of a Reluctant Dreamer makes clear, it’s only the start of a long, precarious journey that plays out in the daily existence of millions of undocumented people in this country. At this writing, the future of many DACA recipients and other undocumented youth remains in limbo. Their fate is in the hands of elected officials who are playing political football with human lives. Alberto Ledesma’s account offers a strong and essential counterpoint to the racism and xenophobia infecting public discourse about US immigration. It brings penetrating light into the liminal spaces occupied not only by Dreamers, but all undocumented immigrants, and makes a convincing case that their stories deserve a chapter in our national narrative. 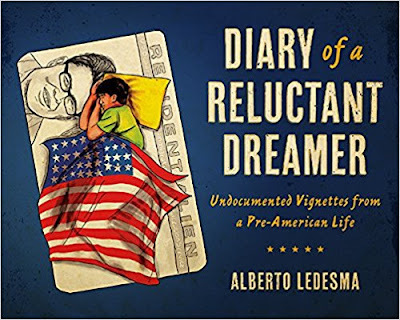 Diary of a Reluctant Dreamer: Undocumented Vignettes from a Pre-American Life is highly recommended. An earlier version of this review first appeared in Latinxs in Kid Lit (latinosinkidlit.com). We thank Latinxs in Kid Lit for permission.